What is the Ontario Brain Institute? What is Brain-CODE and what is its purpose? How do I get access to Brain-CODE for data entry? Which types of data can I enter into Brain-CODE? What are the Zones I keep hearing about? What happens to collected encrypted health card numbers? Which data entry tools can I use? Does Brain-CODE have the capacity to store all of my data, including imaging data? Which data collection and entry standards do I need to follow? When do I enter my data? Can I enter animal data into Brain-CODE? How does Brain-CODE handle magnetic resonance imaging (MRI) data? Where can I find a list of the Common Data Elements (CDEs)? Can I run other tests in addition to the CDE eStudy test battery? Do we have to abandon our subject naming convention and rename our files to adopt the Brain-CODE system? Will Brain-CODE add to its defined list of CDEs? Can we deviate from the provided consent language? Did Brain-CODE have a different name previously that was used on older consent forms? Does OBI have a Research Ethics Board (REB)? How does OBI ensure the privacy of the patients whose data is held and shared in Brain-CODE? Which sections of the Personal Health Information Protection Act (PHIPA) apply to OBI? How do I access my data in Brain-CODE? What does “tiered open access” mean? How does my exclusivity period work? What if 12 months is not enough time for me to collect all the data I need? How do I access the data of groups not listed in my Sub-Schedule C? Can I use Brain-CODE to collaborate with other researchers in my ID Program? Outside my ID Program? What is the Data Access Committee (DAC)? What are some examples of metadata? Which kinds of data can I link with my data? Will my research be acknowledged by third party researchers who use my data? Do I maintain ownership rights of my data? Do I maintain the intellectual property rights of my data and data output? Where do I analyze my data? Which REB do I submit my ethics form to? Are there any REB harmonization efforts in place? The Ontario Brain Institute (OBI) is a provincially‐funded, not‐for‐profit research centre seeking to maximize the impact of neuroscience and establish Ontario as a world leader in brain discovery, commercialization and care. Convergent partnerships are created between researchers, clinicians, industry, patients, and their advocates to foster discovery and deliver innovative products and services that improve the lives of those living with brain disorders. The Ontario Brain Institute (OBI) funds research in over 35 institutions across Ontario in the areas of cerebral palsy, epilepsy, neurodevelopment (including ADHD and learning disability), depression and neurodegeneration (including Alzheimer’s disease and ALS). The diversity of data collected from these programs (imaging, clinical, and genetics), presents a big data opportunity for neuroscience. Brain-CODE is a large-scale database and informatics platform developed and maintained by the Ontario Brain Institute (OBI) where data streams from these programs will be assimilated, stored and analyzed. The core functionalities of Brain-CODE are data capture, federation with other data bases, integration of data, secure data sharing and secure analytics. Indoc is a consortium of not-for-profit research and development organizations that work with OBI to develop Brain-CODE and was assembled based on areas of required expertise. The consortium is led by Indoc Research, who plan and design the requirements of the platform with OBI and implement the technical infrastructure of Brain-CODE. Indoc also works closely with researchers that access Brain-CODE with support, training, and technical services. Other members of Indoc are the Electronic Health Information Laboratory (EHIL), which provides security, privacy, and encryption expertise, the Centre for Advanced Computing (CAC), which hosts Brain-CODE, and the Rotman Research Institute, who provide the neuroimaging informatics infrastructure for Brain-CODE. The Participation Agreement is a comprehensive data transfer agreement which outlines all other relevant rules and guidelines related to how data is transferred, stored, and disclosed in Brain-CODE. This is the document to sign, with OBI’s approval, if you want to upload and share data on Brain-CODE. The OBI built the Participation Agreement in consultation with privacy and security, legal, and ethics policy experts. Note: For OBI’s Integrated Discovery Programs who have a Research Activity Agreement with OBI, the Participation Agreement is Schedule J of the Research Activity Agreement signed between participating institutions and OBI. A Participating Institution could be a hospital, university or research institute that is a part of OBI’s Integrated Discovery (ID) Programs or another institution that wants to upload and store data in Brain-CODE. Participating Institutions will need to sign a Participation Agreement (for the ID Programs, this is Schedule J of the Research Activity Agreements). Raw Data: Data that have not been modified from their original state or processed to remove any Direct Identifiers, and may include PHI. This applies to data that OBI collects from a Participating Institution in order to process it on their behalf, and to data that will be placed in Zone 2 of Brain-CODE that cannot readily have Direct Identifiers removed due to technical limitations (e.g. possible for genomics and MRI data). Brain-CODE has been set up as three “Zones” (see zone figure), each with a specific function described below. Zone 1: A repository of raw data and your personal data management solution. Participating Institutions will have ownership and control over the data they provide in Zone 1, and be able to share it with investigators that are listed as collaborators on their projects, described through Sub-Schedule C of the Participation Agreement. Zone 2: The long-term secure storage of data. Once data entered into Brain-CODE have been processed to remove direct identifiers (unless otherwise approved by an REB) to the extent possible or encrypted, it will be stored in Zone 2. This is also where data can be linked with other data from external databases through a secure linking protocol. Zone 3: Third-party access and analysis of processed data. Processed data may be prepared by OBI for disclosure to approved parties through a data access request, following a further analysis of the risk of identifiability. In an effort to allow our researchers to pursue the maximum utility of their data collected through the OBI-funded Integrated Discovery Programs, we are implementing the capability to link research and clinical data with health administration data. The methodology that we have put in place allows this linkage of data to be carried out without the transfer of health card numbers to OBI or Brain-CODE. A secure algorithm is used to encrypt health card numbers at the point of collection and entry into the browser at the research institutions, which then only transfer the encrypted number to Brain-CODE. Therefore OBI never receives health card numbers and cannot decrypt the health card numbers. 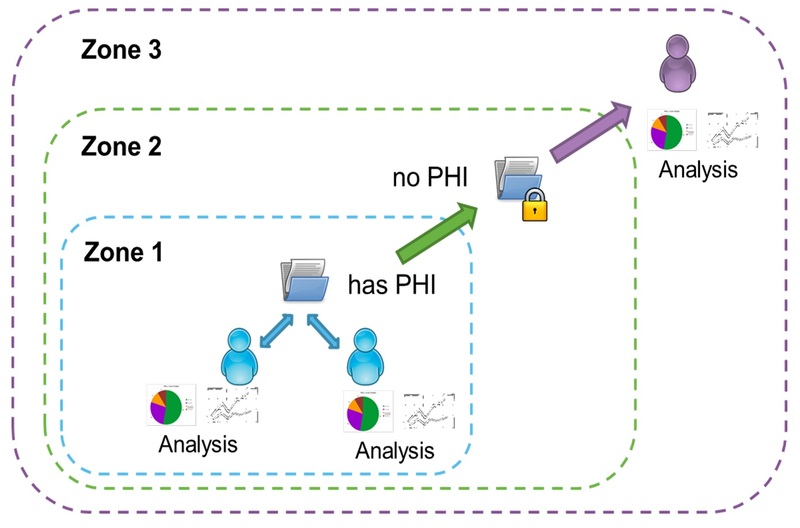 This linking of datasets using encrypted health card numbers will enable investigators on Brain-CODE to access aggregated datasets for a much richer scientific profile of their participants for research. Yes, Brain-CODE will have the capacity to store various types of data including imaging, genomics, proteomics, and clinical data. We have provided the appropriate tools for uploading a variety of classes of data. If additional data types are being used in your study, please notify us at help@braincode.ca, and OBI will review the request to handle the additional data type. OBI believes that the quality of data which is collected is very important and part of ensuring high data quality is data that adheres to standards. This is important so that the data can be compared, essentially comparing apples with apples. A number of Common Data Elements (CDEs) were established for Brain-CODE through a Delphi Process whereby researchers from each of the ID Programs were surveyed to determine the CDEs that are most appropriate to collect for their studies and across multiple disorders. The results of those surveys comprise the list of clinical and demographic CDEs. Investigators using Brain-CODE are strongly encouraged to include the relevant Brian-CODE CDEs as part of their REB submissions, and to routinely collect them as part of their studies. OBI is also working on standardizing imaging data in addition to working with leading international organizations on the standardization of genomics data. We would like Brain-CODE to serve as your online data-storage and management solution. Investigators are encouraged to enter data into Brain-CODE as it is generated, preferably directly through their computers, laptops, or hand held devices. Details on exclusivity are addressed below in the section titled “Tiered Open Access: Data Access and Sharing”, and in further detail in our Data Sharing Policy. Yes, animal data can be entered using the tools provided on Brain-CODE. If you have any additional needs for data upload, please contact us at help@braincode.ca. A component of the magnetic resonance(MR) image that captures a high-resolution 3-dimensional (3D) grey colored image of the participant’s face and head is considered to be PHI. These images are important for some types of analysis by the investigators, so they will be input into Zone 1 of Brain-CODE, where only the researcher who obtained the participant’s consent, and their collaborators can access them. Before this image can be accessed by researchers outside of this study, it will be “de-faced” in the transition from Zone 1 to Zone 2 on Brain-CODE. This means that the pixels in the high-resolution 3D image that correspond to the participant’s facial features are deleted. Some older consent forms stated that identifiable data will not be uploaded to Brain-CODE. However, the understanding of identifiable data at the time the consent forms were written included text-based identifiable data such as the participant’s name and address, which will not be sent to Brain-CODE. Identifiable in these older consent forms was not meant to refer to these high-resolution 3D images. OBI has worked with investigators to clarify this with the research ethics boards (REBS): letters were sent to asking the REBs to confirm that there is an understanding that these high-resolution 3D images will be uploaded to Brain-CODE. This was confirmed with the REBs prior to allowing any data to be uploaded to Brain-CODE. If you have any questions, please contact governance@braincode.ca. A list of the available CDEs can be found here. Yes, you may run other tests in addition to the CDEs outlined. You will need to work with OBI to set up anything additional that is required for the data you want to collect. To ensure consistency across the subject registry, we have adopted a common naming convention for Brain-CODE and the ID programs. Please find a link to the naming convention here. Although there are no plans to extend the list of CDEs at this time, this is an evolving process and we will continue to work with our researchers towards improving and enhancing the CDEs, for example, we will need to identify genomics standards. The consent language specific to Brain-CODE is a critical component of the study consent forms and was drafted to provide transparency to study participants. It is imperative that we communicate how the information provided by study participants will be used to further our understanding of brain disease. With this goal in mind, the consent language was developed in consultation with ID program investigators, legal, privacy and health policy experts and the Office of the Information and Privacy Commissioner of Ontario. To ensure consistency across all research sites, and to maximize the output of our investigators with the data collected and stored in Brain-CODE, it is important that the language remain as is provided and embedded within the study consent form. Consent forms for studies that began before harmonized consent language was available may have some differences that reflect the state of Brain-CODE at that time. One example is the reference to Brain-CODE as “InDOC” or “DOC”, which was the name originally considered for Brain-CODE. If you come across this wording, note that this does refer to Brain-CODE, and not to any other database. However, if neither Brain-CODE, InDOC, or DOC are mentioned, please contact governance@braincode.ca to verify the wording. In some previous consent language there may be mention of an OBI Research Ethics Board (REB), as this was originally considered to facilitate data access requests on Brain-CODE. As of now, OBI does not have a dedicated REB. Instead, data access requests will require that investigators making a request also submit an ethics approval by a recognized institutional ethics board. If there are any other consent language references that require an explanation, please notify us at governance@braincode.ca. Electronic Service Provider, providing the technology to a single Health Information Custodian to remove Direct Identifiers to the extent possible, or as authorized by the Study Protocol. Health Information Network Provider (HINP), providing services to two or more Health Information Custodians to enable them to use electronic means to disclose Data, including Raw data, to one another. In OBI’s capacity as a HINP, researchers taking part in specific Studies will be enabled full and secure access to Study Data, in accordance with OBI’s Governance Policy. After you have entered your data on Brain-CODE, you can access it anytime by signing on to the Brain-CODE portal. You will always be able to access your data and the data of your specified collaborators easily through the web-based portal. There are two ‘tiers’ of data in Brain-CODE: Public data and Controlled Data. Controlled data: Data that may represent a risk for re-identification and will undergo additional risk evaluation and approval steps prior to release. Public data: Data that do not contain PHI and do not have potentially identifying information if further processed or combined. Registered portal users have access to all public data without completing a Data Access Request. Controlled data requires a Data Access Request along with an REB approval to be submitted to OBI's Dat Access Committee for review. Anonymous visitors to the Brain-CODE portal will not be able to access public or controlled data, but may be provided with summary descriptions from studies and datasets in Brain-CODE. Investigators have the choice to maintain exclusive access to data that they have produced for 12 months. If you feel that 12 months is too long, you may choose to shorten the exclusivity and make your data available to access at any point, and keep in mind that you can continue to classify your data as Controlled even if accessible. During the period of exclusivity, only your collaborators will be able to access the data. Potential investigators that are not your collaborators can see metadata that relates to your data, and will be able to contact you through Brain-CODE to ask to collaborate. For studies requiring the recruitment of patients where it is anticipated that the exclusivity period will elapse prior to the enrollment of a set number of participants, the OBI and the Data Access Committee will work with the investigator(s) to determine an incubation period that will account for this potential delay and will effectively increase the exclusivity period. Other scenarios that may warrant an incubation period include challenges with experimental design, or if the study is a clinical trial that must remain blinded for a period longer than 1 year. If there are any questions, please contact brain-code@braininstitute.ca. Your collaborators are listed in Sub-Schedule C of the Participation Agreement (Schedule J of the Research Activity Agreement if you are part of OBI’s ID Programs). If you would like to add or change the names on this list, please contact us at brain-code@braininstitute.ca. We keep lists of your collaborators who will have access to the data set of that particular project. These are the researchers that can view and use the data before the exclusivity period runs out. You and your collaborators (on Sub-schedule C) will be able to upload, download, and analyze your shared data directly and securely. To access Controlled data from researchers outside of your collaboration network, you must complete the online Data Access Request which includes a listing of the data being requested, the analysis plan for that data, and proof that both have been approved by an REB, where appropriate. We also would like to encourage getting directly in touch with the investigator(s) who have produced the data you would like to access (Data Producers). This request will then be seen by the Data Access Committee, who will decide whether access will be granted. More information is available in our Data Sharing Policy. One of OBI’s main goals is to promote collaboration, and through the use of Brain-CODE we hope that collaboration and sharing for research is easy and effective. You can add collaborators who can access your data and you can request to share data with investigators you are interested in working with prior to the end of your exclusivity period. Please email the Brain-CODE team at accounts@braincode.ca to request adding new collaborators to your project. The DAC develops and maintains publication, data access and sharing policies and oversees Data Access Requests. There are 10-12 members, with representation from each of the ID programs, OBI and Indoc. Some examples of metadata include the study name, number of participants and common data elements. You will be able to link your data with data from external databases using a secure linking protocol. This will augment and complement the data in Brain-CODE, enriching analysis and enhancing data outcomes. These options for linkage are available whether your data are under exclusivity or open. OBI is working hard to establish linkages with relevant databases that would be useful for your research. All publications, presentations, or disclosures of analyses or ‘Work Product’ based in part or in whole on Data in Brain-CODE must acknowledge the Participating Institutions that have contributed to this data, the ID Program if relevant, the OBI, the Brain-CODE platform, and the Government of Ontario. Independent collaborators that have contributed to study data should also be acknowledged. OBI would like to see new collaborations as data is shared between groups and investigators that are both within and outside a particular study. We recommend that you use the following stock language in the acknowledgements section of your manuscript: “We would like to acknowledge the individuals and organizations that have made data [and analysis] used for this research available including [ID program name/Data producer name], the Ontario Brain Institute, the Brain-CODE platform, the Government of Ontario, as well as [independent collaborator names]." The ownership of data generated through OBI-funded initiatives will remain with the Data producers, namely the Participating Institutions. Neither the OBI, nor its agents or subcontractors will claim right, title, nor ownership to these data as entered into Brain-CODE. All rights to these data will be retained by the Participating Institution, as set out in the Participation Agreement (Schedule J). Participating Institutions do, however, grant OBI a non-exclusive worldwide license in order to use Processed Data in order to disclose such Processed Data to third parties, and irrevocably grants such third parties the right to use such Processed Data for research purposes and agrees that such third parties may publish any research created by such researcher without any further consents required of the Participating Institution. This disclosure must be approved by the Data Access Committee. Ownership of data in Zone 1 that are generated through OBI-funded Studies will remain with the Participating Institutions, as described above. Where data disclosed in Zone 3 results in a researcher’s independent analysis of the Data (the “Work Product”), Work Product will generally be owned by that researcher and his/her organization, if any, in accordance with applicable intellectual property policies, and any applicable intellectual property terms set out in the Study Description Schedule. We encourage Data users and Data Producers to collaborate on studies. Your own data can always be available for analysis using your own tools and those available on Brain-CODE. OBI continues to develop an analytics capacity as part of Brain-CODE. Currently, Brain-CODE provides access to Analytics Workspaces which can be made available to IDP researchers upon request. Here, researchers have access to a host of analytical tools and can also bring their own licenses into the virtual workspace to take advantage of the high performance computing capabilities. Ethics forms should be submitted to the REB at your local institution. Most of the studies funded by OBI are of low risk to the participants and span multiple sites. To expedite the review of these applications, some REBs have agreed to share their reviews with one another. If you would like to learn more about this process, send us an email here.